I just came across this new report on e-learning: http://leapofreason.org/e-learning-report/ — it’s all about how learning has changed and should continue to change moving forward, with recommendations on what e-learning providers might need to do differently. As some of you may know, I’m considering going back to graduate school (vs. learning by doing or taking supplementary online courses), and thought this report was both well-informed and timely. Interesting and thanks for posting! Would love to do a whole session on how networks have changed learning (not just e-learning). I didn’t have time to read the full report. What are your takeaways and how might it relate to you future work? (Is e-learning the method by which you are thinking of graduate school or a potential area of study for graduate work)? Also the impact of Khan Academy and the flipped funnel approach to subjects like math and science. Some schools are assigning Khan Academy and other online learning systems as the introduction to a subject and then have the teacher work with students to review their understanding. The idea is that it provides more individualized analysis rather than rote lecturing. 1. At some point I considered having a goals conversation with the client using Eugene’s fail-meet-wildly exceed expectations framework. However, I received substantial push back from my colleagues and others whose opinion I sought. 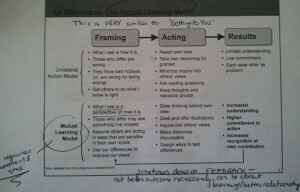 Their point was that framing things in the negative could lead to negative feelings, and results. One person suggested asking the following questions: What does success look like? What would have to be in place for us to succeed? What obstacles would we need to overcome? Because I haven’t ever had a conversation with a client about what failure would look like, I don’t actually know whether it works better than the success / obstacles conversation. I would love to hear people’s experiences having a what-failure-would-look-like conversation with a client. 2. All design conversations were done over the phone with individuals I’d never met in person. As a result, it was difficult for me to read their genuine reactions to the workshop design. (This is, by the way, part of my personal learning curve.) In the future — and given my personal communication style — I think I’ll ask for video conference conversations, especially early in the project. @eekim, my experience has given me a different perspective on the in-person/online distinction we’ve talked about; would love to continue that thread with you at some point. 4. Finally, we did a really good job pivoting the workshop after an exercise didn’t get as much traction as we had hoped. I’m very proud of us for our willingness to shift, but next time I design a somewhat experimental workshop like this one I’d like to think of a Plan B ahead of time. I wonder if anyone’s done this before, and how they want about doing this? As an aside, I’m really anxious to hear from @marie and @eugenechan about place+time for our next Bootcamp! Hopefully see you all soon, and take care. How interesting! Thanks for taking the time to share all this Jess. I think the failure push back is super interesting. I can imagine that being a norm in many business consulting circles…but I have found so far using this framework (just got off a call where we used it for a meeting design actually), that it really helps clarify what the group does not want, and my sense is it actually creates a sort of stake in the ground benchmark of “this is not good enough, we must aim for better than this and watch out for this particular pitfall”. E.g. we were doing a large group meeting design goal setting session, and one person typed in (we use shared display via google docs while we do it) “poor turn out” as a fail. It spurred a really important conversation about what good turn out was, what # of participants we were aiming for and why, and what the space constraints we were dealing with were. I’m not sure any of that would have gotten surfaced so quickly had we not had the failure column in the goals list, because “good turn out” seems more obvious & less scary… in acknowledging what a fail would be, it can help deepen conversation & asking important questions to be sure to avoid that outcome in a different way than I’ve seen around success metrics. I have not yet seen it create the outcomes your team was nervous about. And we’re really creating 3 sets of success markers and 1 fail markers with EEK’s system so from a positive psychology sort of angle I don’t see that being a problem – still plenty of focus on success. Curious what others think / have found about this one? Re: #2: I agree getting even a glimpse of face time helps so much in being able to read people’s reactions on phone calls, and a video hangout intro call can be a decent substitute for that. Using shared display when you’re on calls can also help get a good pulse. E.g. if someone’s quiet but typing ideas into the goals list or chat box you know they’re engaged & can get a sense of their thinking. Re #3: If you have time, back up /contingency thinking can be great both to make more effective meetings, to ease your mind re: being prepared, and also just good practice — sharpening more tools in the tool box so to speak. I think as we get older/more seasoned we’d have to do this in a formal way less, but as younger practitioners it makes sense if time allows to over train & contingency plan if nothing else as great practice in creative process design & brushing up on more tools/ approaches as part of meeting prep. I do this a lot with workshops & meeting prep – one thing I’ll do is make a detailed plan and then at the end have a list of other exercises I might want to throw in there if things get off course – just having that list handy & whatever notes I need to help me facilitate those other activities well makes it easier to switch gears during the event when needed. Sometimes there’s a clearer fork in the road – e.g. we’ll start with activity A and that will lead us either in this direction or that direction, and then have two pathways planned out depending on where the 1st activity lands the group. Reminds me of how on sports teams we would practice all sorts of different plays, even though we had our go to standards during games, because then you can change it up when needed and still be able to execute well. That’s the craft of what we do I think, and the more prep time we can put in the better at it we can become, even if we don’t need to use all the prep, it’s still great practice. Also excited to hear about @marie & @eugenechan‘s plans!! 1. I think the confusion might be because of the way my toolkit is structured, with the Failure column coming first. When I’m walking people through this exercise, I always start with success. (I do the same when I’m debriefing.) Many of my templates currently share this flaw, where it’s not obvious which field to complete first. It’s something I need to fix. 2. I’d encourage you to test your assumptions! We have a lot of assumptions about video and visual cues in particular, and many of them turn out not to be true. There’s a better way to get the feedback you seek: checkouts. @eekim I’m looking for the language you used for the “1000 questions” exercise… any idea where I could find a description of it? Also, I’m facilitating this exercise PRIOR TO a 60-min prototyping exercise and following a 60-min creative brainstorm, and was wondering if you or other bootcampers had any suggestions re: how to wrap it up… In other words, participants are brainstorming ideas, then they choose a concept to develop, then they ask questions about it, and then they start prototyping… but I’m wondering how the transition from QUESTIONS to PROTOTYPING might work. I’m hoping to finish a draft of a set of these by the end of this month for broader distribution. Feedback appreciated! I would start with the questions, then go into the brainstorm. haha I used this today myself, how funny! We’re somehow on the same thread Jess – I literally just sent out an email to someone with the exercise! 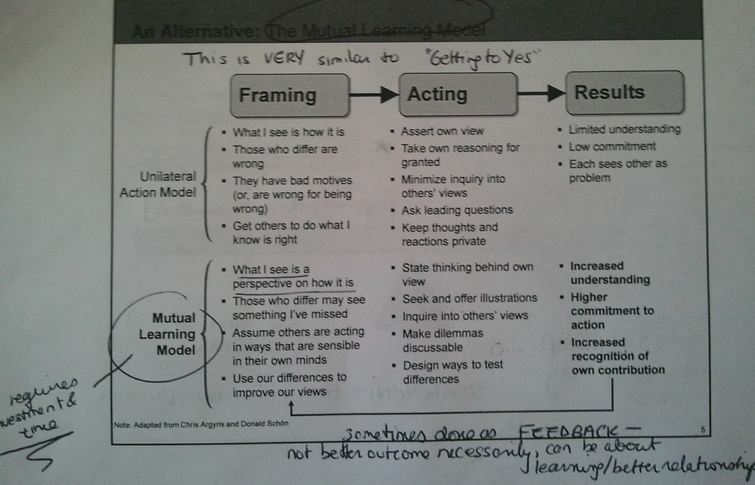 Team, I was reflecting on Brooking’s comment on the fact that companies seldom train their employees in having difficult conversations, and remembered that I actually attended a Monitor Training two years ago on “productive interactions.” I included two marked-up handouts (above). 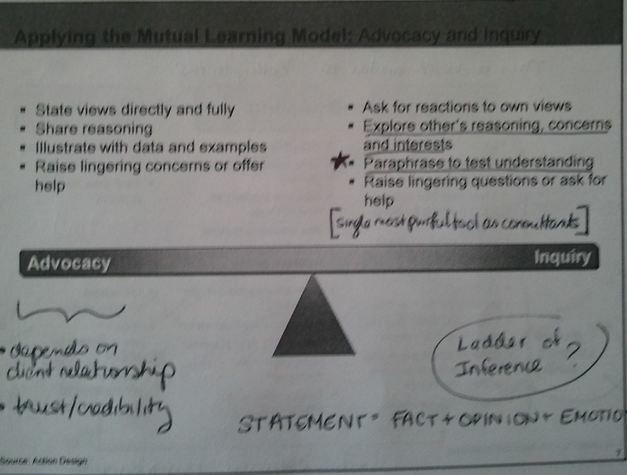 The first presents a framework for thinking about the interaction (framing–>acting–>results) and differentiate between “unilateral” and “mutual learning” approach… The second highlights the importance between advocacy and inquiry in the conversation. I’ve heard lots of my colleagues reference this training during the merger as a powerful tool that helped them get through painful phone conversations… Anyways, hope it’s helpful! I don’t remember @brooking say that. I remember her commenting on the fact that we were doing these sorts of workouts in a place like Monitor, but I don’t think she was implying that companies seldom train employees in this stuff. In fact, I thought it was you who made the point that people are rarely given the opportunity to practice this stuff! All that said, I very much appreciate you sharing this, Jess. I would go further and say that you are more likely to get training like this at a large company than at a small one. And, this helps highlight why I think things like bootcamp are necessary. Frameworks are great, but they need to be reinforced by constant practice. The paradigm for this type of training is the one-off, where the focus is on teaching a framework, not reinforcing a culture of practice. People are left to their own devices to get the practice afterward. Whether or not a bootcamp is the right model to support ongoing practice, my hope is that all of you (and beyond) are inspired to make practice a more integral part of your… well, practice! 2. #failforward is back in play! Let’s use it! 4. 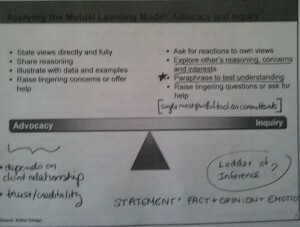 Eugene, I’ve been considering using the 100 questions (or a variation) in a convening I’m designing for work. Brief, I’m thinking of having a “peer assist” that starts with the 100 questions to help reframe / crystallize the challenge. My question to you revolves around what might follow the 100 questions exercise (or something similar) when you’re in a group setting… Any thoughts? Thanks for sharing your thoughts and links, @jessausinheiler! As I noted in my most recent post, I’ve started collecting links posted here into one document, which you can access in Resources in the main menu above. I’m going to respond to most of your other points in separate posts (other than to echo your sentiments about @marie: let us know how it went!). Regarding integrating your 100 questions exercise into your convening: I’d like to open this up to the other bootcampers before making my own suggestions. What questions and advice do you all have for Jess? I loved the practice of asking folks what makes them feel powerful and then dissecting–and sharing–the elements that make up a powerful experience. In our small group, we heard things as varied as feeling physically strong, overcoming physical weakness, and facilitation. Using classical and contemporary videos to learn about power was brilliant. I’d love an opportunity to analyze our own videos as well. Really looking forward to our next session. Thanks for sharing your insightful and intimate reflection, Jess! For the power workout, I’m still feeling comfortable not providing it up-front, although I will continue to monitor this. I don’t mind people feeling discomfort, because that’s when learning happens, and it’s a useful competency to practice. Your third bullet helps validate that for me. However, I also appreciate it when you share that discomfort, as there’s a fine balance in how much or how little you want people to be experiencing. I’ll share the video from this group so that you can do the analysis if you’d like. Finally, thank you so much for sharing the story about your phone conversation. We have a “difficult conversations” workout coming up, and so you’ll be able to examine this question in a very real way very soon! 1) I was listening to Marie’s challenge with an ear to the questions that were implicitly / explicitly asked and/or answered. But in the process of listing and posting questions, I sometimes forgot to include the highest level questions — the ones we started with, the most important ones. Starting with the details vs. up-framing can be so easy to do, especially with colleagues who you think are thinking about the same thing! 2) Eugene Chan’s measured-self like experiences really got me thinking about this video: http://vimeo.com/31401743 about a young woman who decided to make a lifelong change in her weight by simply measuring and tracking her weight (10-day running average) over time, based on the Hacker’s Diet. Her story is super inspiring, and is all about creating SYSTEMS with positive and negative feedback loops that help us maintain a healthier lifestyle. Thanks for your reflections, Jess! Your first thought was a wonderful reminder for all of us. We all do this; this is how our muscles naturally develop. Part of the point of bootcamp is to make it a habit to start with the highest-level questions and to simply reflect back what you heard. Love the video and the lessons underlying it! Looks like the BART strike is off for at least a day, so looking forward to seeing all of you at Bootcamp! 3) It comes much more naturally to me to reflect on how well I or someone else did vs. keeping score. I think part of it has to do with the subjectivity of the game (who says you get a point? how many points? ), but part of it may have to do with comparing myself against other people and against myself over time… I’ll keep you posted on whether and how this feeling evolves over time. +1 for your first post, Jess! Thanks for sharing these reflections. Regarding #3: Definitely interested to see if your feelings evolve over time. What I may do at the end of this process is simply compile the feedback without the scores, so that you all can track in a qualitative, but more concrete way the progress you make over the course of bootcamp. Have a wonderful weekend, and looking forward to next week!